Of the two Captain America books that Ed Brubaker is currently writing this one is by far the best, which is saying a lot since I like the other quite a bit. It seems sort of obvious to say this, but somewhere along the line Brubaker has elevated Cap WWII stories to an art form. Though we’ve seen the early days of Bucky and Cap told before, never has it been done with this level of detail and storytelling craft. This World War II-era story is the book to throw in the hands of people who loved the Captain America movie and want to know what comics-universe Steve Rogers is all about. Granted, it has the kid-sidekick version of Bucky, which is different from the film, but it’s presented in a way that is charming without being dated or goofy. Ed Brubaker and Mark Andreyko’s smart, economical script also doesn’t shy away from the serious aspects of a teenager in costume going on military missions. The friendship between Steve and Bucky anchors the book, though, and Chris Samnee’s delightful art does as much to capture their camaraderie as any dialogue could. Bettie Breitweiser’s peerless work as a colorist is the icing on a glorious cake. 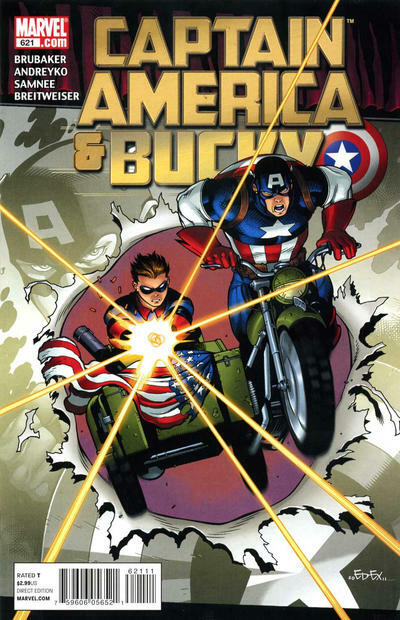 This is everything you could want a Captain America comic to be. This book is a heck of a lot of fun. Detailing Cap and Bucky’s initial adventures before joining the war effort in Europe we see these two men getting to know one another and Bucky coming to grips with what it means to take a life. I don’t know if it’s the addition of Mark Andreyko as co-writer or that he’s now free of event-related constraints but there’s a life to Brubaker’s Cap here that’s been missing for the last year or so. Also, there’s not enough to be said for Chris Samnee’s art. Direct, action-packed and a little playful, Samnee can pull you through all of the emotions the story requires. I hope this team gets to run on this book for a long time, because it’s a treasure.